This post is sponsored by Luxury Beauty Studio. Permanent makeup for lips and cosmetic tattooing: would you get your lips colored? PMU lip shading is great for people with hyperpigmentation to correct the color and define the lips while still looking natural. If you’ve been following me closely on Instagram, you’ve probably seen weekly updates on my stories about my latest cosmetic procedure: I got my lips tattooed! After I got my eyebrows microbladed by Lynn at Luxury Beauty Studio in Tustin, California, I put some major thought into getting permanent makeup done for my lips. While eyebrow microblading is becoming a more common procedure, other permanent makeup services like lip shading and eyeliner are still uncommon. I put my faith in Lynn with my brows (and they turned out so well! ), but the very idea of permanent makeup was still nerve-wracking for me. 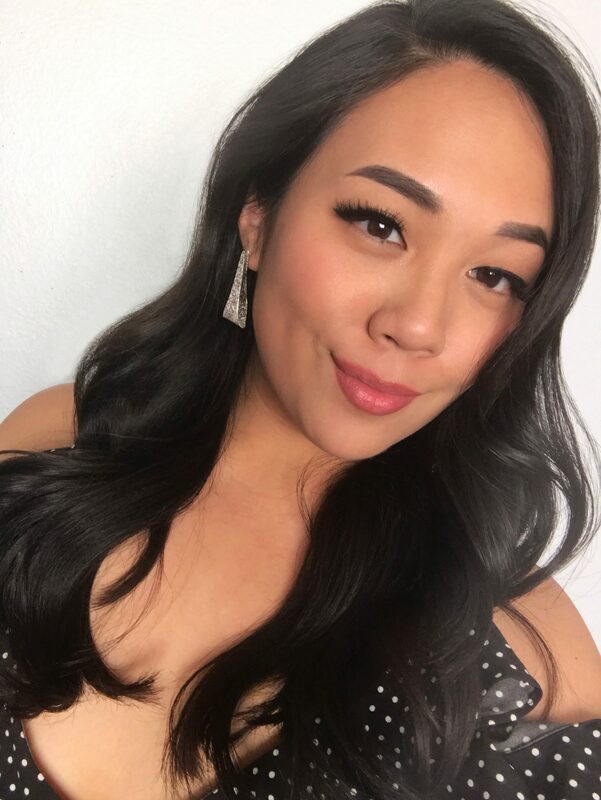 But after some time, I took the plunge and got it done, and to sum things up: I absolutely loved how natural the results were! Before I’d ever met Lynn, I was very insecure about the grey coloration on my lips caused by hyperpigmentation. When I was a teenager, my first time shopping at Sephora resulted in an overzealous sales associate pushing tons of product on me, and she also pointed out I needed a lip balm with SPF in it because I had hyperpigmentation. This was never a concern of mine until she’d pointed it out! I began experimenting by filling in the darker grey color with a lip pencil that resembled my natural lip and saw such a difference in my overall look once the grey was covered up. Unfortunately, my natural lip liner trick didn’t work so well. The lip liner would come right off after a meal or several sips out of my water bottle. It was a hassle for me to constantly have to line my lips with a pencil every day just to give my lips the natural color they should have by default! BEFORE: No makeup and before lip shading. You can see that I have a lot of grey around my lips. AFTER: Fully healed lips with PMU lip shading after 2 months and 2 sessions. I’m only wearing lip balm, no gloss or color! Lip hyperpigmentation is actually a common and harmless issue that many people have. Unfortunately, for me, my hyperpigmentation was very severe and as a result, I had much more grey discoloration and less defined outer edges of my lips than most. If you are olive-toned or are more tan/dark-skinned, the higher amount of melanin in your skin can darken from sun exposure, so hyperpigmentation on the edge of the upper lip area can be common. 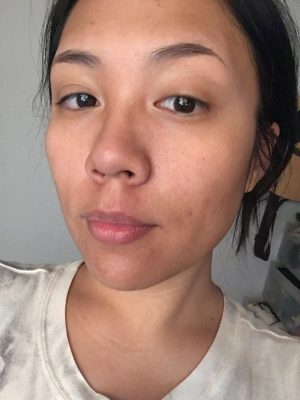 I may not be of darker skin, but the amount of melanin in my skin from my Filipino heritage makes me predisposed to getting hyperpigmentation than, say, someone from Caucasian descent. If you are considering permanent lip shading to conceal your hyperpigmentation, be aware that hyperpigmentation may cause the tattoo pigment to not retain its color and may require touch-ups to assure the color is uniform. I required 2 sessions because my hyperpigmentation was darker than the average case. It’s good to call and inquire or come into the studio so your technician can see your lips and decide if they are skilled enough to provide you lasting results. Lynn did a fabulous job with my hyperpigmented lips, so of course, I highly recommend her if you’re in Southern California. She is amazing at permanent makeup and microblading and her prices are much more reasonable than most places. Click here to check out Luxury Beauty Studio in Tustin, California. You can also schedule an appointment for a consultation and see if you are a good candidate for permanent makeup. The rough outline of my lips was drawn on to define the proper shape. This was not the actual color used! What Is PMU or Cosmetic Tattooing? The process of cosmetic tattooing is similar to getting a regular ink tattoo: your PMU (permanent makeup) artist uses a brand-new needle to inject mineral-based pigments into the skin. However, unlike tattoo ink, the pigment is powder-based, which makes the colors much more natural-looking and does not fade into a grey or green finish as time passes. Although the name refers to “permanent,” modern-day cosmetic tattoos that use powder pigments fade much more naturally as time passes, so you can always get touched-up after a few years. Think of it as semi-permanent more than anything. Lynn was very thorough about telling me how to prepare for my appointment weeks in advance. When I arrived for my appointment, I was briefed through what I should expect during the session as well as what to do at home for proper aftercare. The process was simple: Lynn drew the outline of my lips and made sure I liked it, applied numbing cream and let it sit for about 20 minutes. Then she began the process of applying the color using a fresh needle and pigment while reapplying numbing cream as she went to assure minimal discomfort. It sounds silly, but vitamins like fish oil, niacin, and vitamin E can also cause your blood to thin. I’ve always known about avoiding aspirin, ibuprofen, and alcohol as these should be avoided when getting tattoos, but I never knew about the vitamins and supplements! I am assuming that the face is a very delicate area and bleeding may be caused by ingesting these vitamins. Most importantly, if you’ve been using any retinol-based products or prescription-strength acne medications such as Accutane or Retin-A, I highly suggest temporarily stopping use around the mouth area for at least 30 days prior to your lip appointment as it can make your skin much more sensitive during the procedure and may possibly interfere with the healing process. Some technicians say you only need 7 days or 2 weeks, but I would much rather be safe than sorry and stop at least 30 days prior to your service. One pro tip from Lynn: I was advised to start exfoliating my lips with either a facial scrub or by scrubbing gently with my toothbrush every night 7 days before my appointment. This helps with the healing process and maximizes color retention. Immediately after the service was completed. 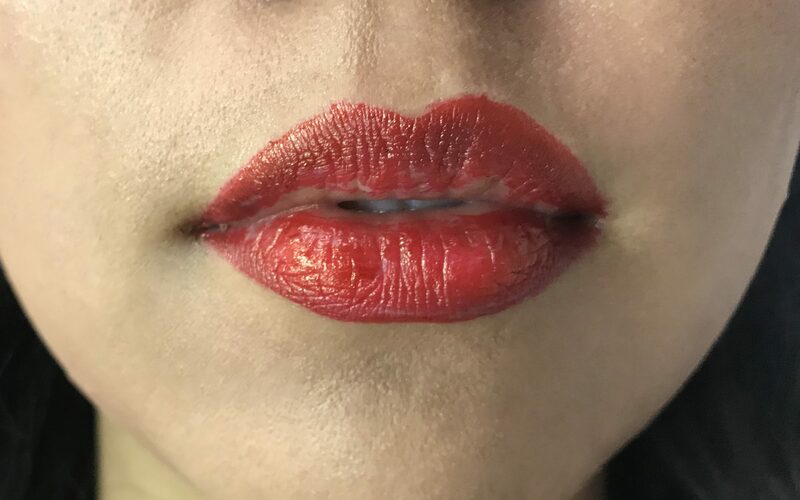 The lips look very swollen and the color is bright red, but the pigment will peel and fade to a natural finish after a month or two. I’ll be honest: yes, during the procedure, there was a good amount of discomfort. 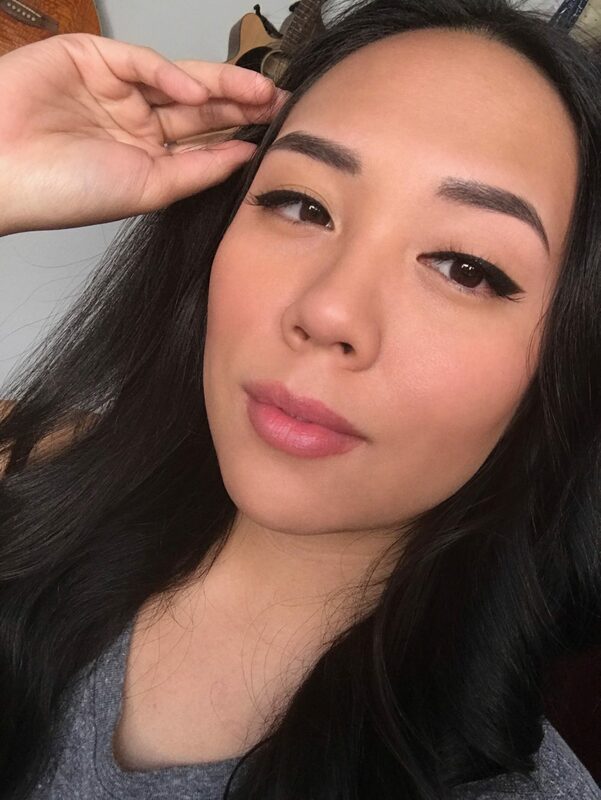 I had no issues with pain when I got my eyebrows microbladed, but the lips are a whole different story! The lips have many more blood vessels, which makes them more prone to sensitivity and swelling over any other area on the face, even with numbing cream. My first service was the most uncomfortable one out of both appointments: the whole session was about 2 hours because my hyperpigmentation was so dark that those areas were not taking the color well, so Lynn had to make sure that those areas received a good amount of pigment to make sure that the color would retain after healing. After the service, I took 2 200mg Ibuprofen tablets, tried to eat (and failed miserably because my lips felt so swollen and tight), and then immediately went home to binge watch Netflix while gulping down some Juice it Up with a straw. My lips were swollen as if I’d gotten lip injections and it felt almost as if I’d gotten punched in the mouth. They felt extremely tight and tender to the touch, so it stung a bit to clean them and apply A&D ointment to keep them moist. 8 days after the permanent makeup application: You can see that the bright red-orange color starts to peel, revealing a pink color underneath. The pink will settle in and fade after 1-2 months. For about a week I was experiencing the normal peeling along with some oozing plasma (you can see it on Day 5 and 8 where it looks a little glossier than normal). I freaked out because I thought it was pus and that I was getting an infection, but apparently plasma can sometimes come out during the early stages of the healing process. Although you might not have the same experience, don’t freak out you do because it’s probably just plasma. Infections will come with an unbearable stinging and burning sensation, so it’s easy to differentiate between the two. During the first week I ate very gingerly and cut my food into tiny pieces, eating with my hands to avoid accidentally stabbing my lips with a fork. I drank all my liquids with a straw and made sure to clean my lips with a moist cotton round and reapply A&D after each meal. 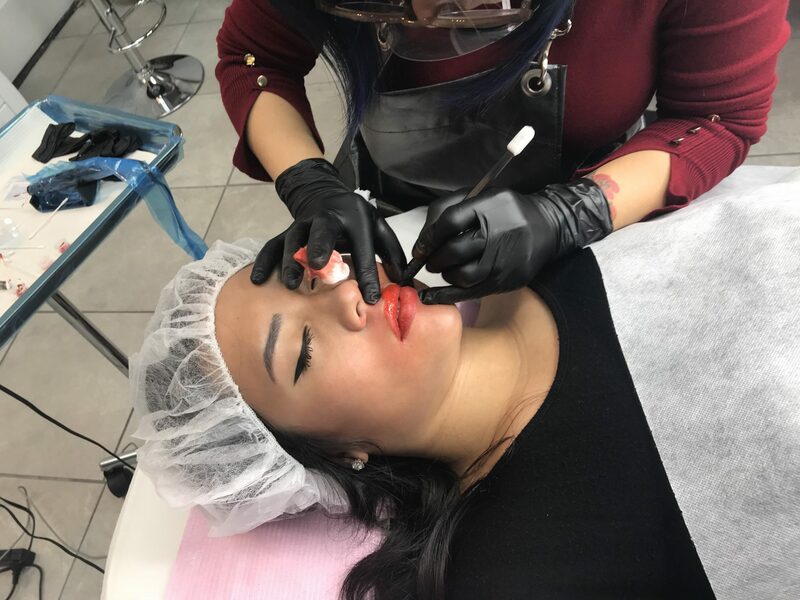 It’s safe to say that for the most part, getting your lips tattooed might require a bit more TLC during the healing process versus getting your brows microbladed. After my first appointment, it took about 3 weeks for my lips to fully heal and about 1 1/2 months for the color to settle into its true hue. It was gorgeous! However, there were some spots where the color faded, so of course, I had to get my lips touched up. I could have gone without a touch-up since natural beauty normally comes with flaws, but there were some subtle spots where the color was brighter. After looking at my fully healed photos after my 1st session (photo below) and 2nd session I’d probably say that after the 1st session resembled my natural lip color the most while the 2nd session gave it more of a more pink finish – not that there’s any problem with that, but it’s also something you can think about if you prefer a more natural color or want to add a bit of pink to add that fresh, glowy, radiant color without having to resort to lip gloss. 2 months after the procedure: From red-orange to light pink and fully healed to a natural rosy color that resembles my inner lip. You can no longer see any grey hyperpigmentation on my outer lips and my lip line is now much more defined. The healing process after my 2nd appointment was way more tolerable in terms of pain. I’m assuming that because most of the color was already applied during the 1st session, there wasn’t going to be as much done the 2nd time around. 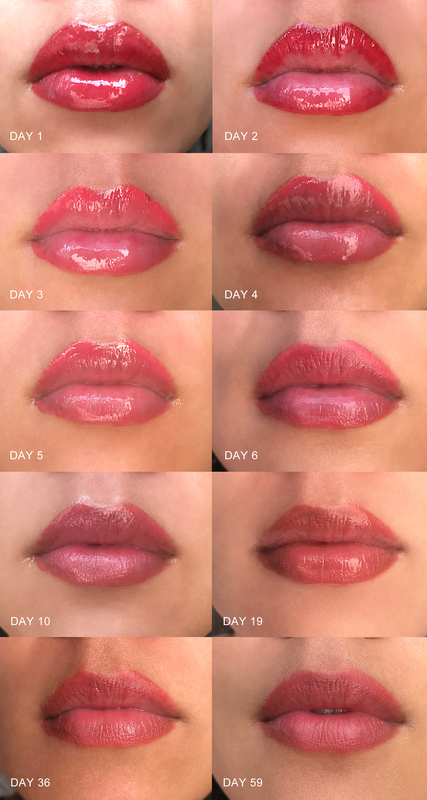 My recovery time was also much quicker: I had significantly less swelling and it took only 3-4 days for my lips to finish peeling. I experienced no plasma leakage and was able to eat immediately after my service (albeit very carefully and still taking 400mg of Ibuprofen to reduce the soreness). FYI, I tried a lot harder to be more diligent this time around by taking a photo every day at the same time every morning in front of the window for the most consistent lighting. Healing after my touch-up session: This time we used more of a pink color to offset the red-orange undertone of my natural lip color and create more of a pink finish. The healing process was much faster this time around. Should You Get Your Lips Tattooed? The big question. I think with any tattoo or cosmetic procedure it definitely depends on if you either 1) desire a more defined, perfect pout, 2) have hyperpigmentation and would like to conceal it, or 3) are lazy and/or want to look fabulous upon waking up. 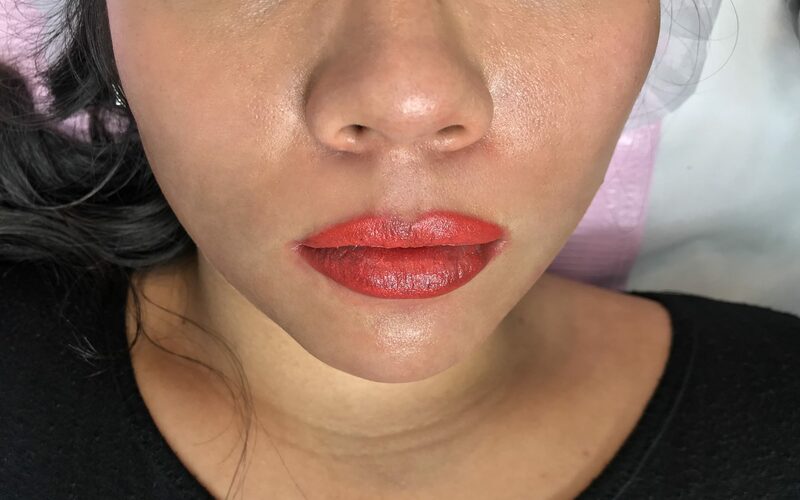 PMU lip shading at Luxury Beauty Studio costs approximately $800 (touch-ups at $150) and the results will last a few years, so to some people the price may not be worth it if they already have a naturally rosy and defined pout, whereas others like me can see that price tag is well worth it. Of course, I have special discounts for my readers, so continue reading! Overall, the process of lip tattooing requires at least one month to fully heal and settle into the color, so I definitely suggest to schedule your appointment after any vacations or important events where you can’t be seen with swollen, discolored and peeling lips. Below is a photo of my fully healed lips 2 months after my touch-up session. I’m wearing foundation and eye makeup but no lip makeup, only lip balm! Fully healed lips with PMU lip shading after 2 months and 2 sessions. I’m only wearing lip balm, no gloss or color! To schedule your appointment, you can book online here. What do you think about permanent makeup and lip shading? Will you be getting your lips colored too? Let’s chat in the comments below and don’t forget to subscribe to my newsletter for more beauty posts! This post was sponsored by Luxury Beauty Studio. Although sponsored, all opinions are my own. Previous Post Spend, Save or Invest: What Should You Do With Your Tax Refund? It’s kinda funny you mention lips and eyes as being uncommon, because permanent eyeliner and lip liner are the OGs of permanent makeup. They were very in fashion in the 1970s and 1980s and fell out. Microblading isn’t completely new either but the technique has improved. Take a look at older ladies who have blueish thin eyebrows! It’s good that these techniques are getting better. Your lips look amazing! Wow!! This was sooooo well written and super informative. Makes me wanna get PMU….not PMS though. Lol ha! completely ruined my vacation and my husband !! On the 6th day it got so bad it bled. I kept texting my beautician on what i should do next. She kept assuring me it will be ok. I could not trust her anymore but I had no choice as i had no one to guide me. Thanks so much for your pictures it helped me feel better. it was somewhat similar but mine was much worse! Your reply is very much appreciated since I will be having my fist session this coming Wednesday. Hi Beth, thanks for reading! I actually don’t know the colors used as it was a customized blend – I assume that if your artist is informed, they will be doing the same for you. I also think they should be recommending a color that’s natural to your skin tone. I wanted a different color, but my artist recommended that we go with colors that would emphasize my natural color rather than going with one that doesn’t match at all because once it starts to fade it won’t look very flattering. Think about longevity, especially since the lips fade much faster than areas like the eyebrows.